The province consists of two sections, the island of Newfoundland and the mainland portion of Labrador. The most easterly Canadian province, the island is situated at the mouth of the Gulf of St. Lawrence. The province lies between the 46th and 61st parallels; most of the island lies below the 50th parallel. To view maps of various areas of Newfoundland and Labrador see the Index of Maps Used on the Site. Queen Elizabeth II, St. John's, NL. 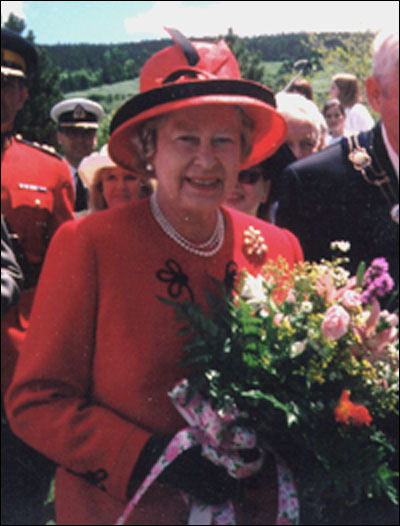 Queen Elizabeth II during her 1997 visit to St. John's, NL. Reproduced by permission of Kimberley Churchill. Photo ©1997. As the reigning monarch of Great Britain, the Queen is the head of state for Canada. She is represented federally by the Governor General and in each province by a lieutenant governor. The present Lieutenant Governor is the Hon. Judy May Foote, who was appointed as the Queen's representative in Newfoundland and Labrador on May 03, 2018. The Lieutenant Governor has a web site at http://www.govhouse.nl.ca/. The Hon. Dwight Ball is the current premier of Newfoundland and Labrador, and leader of the Liberal Party. He is the 13th post-confederation premier of the province. This information was compiled from a variety of sources by Wendy Churchill, Alex Dalziel, Vanessa Rice and others, and is accurate to May, 2018.